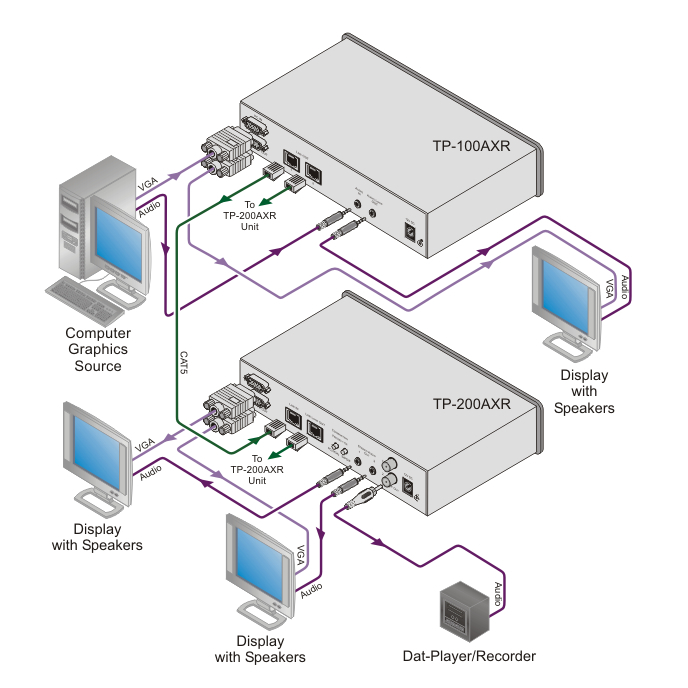 The TP-100AXR is a twisted pair transmitter for computer graphics video and unbalanced stereo signals. The TP-100AXR converts the input signals into a twisted pair signal and the TP-200AXR converts the twisted pair signal back into two computer graphics signals, as well as two stereo audio plus two S/PDIF audio signal. Sync Polarity Settings - H & V switches for improved display compatibility with the CAT 5 outputs. System Range - Up to 200m (640ft). Greater distances possible depending on resolution and cable. Desktop Size - Compact size. 2 units can be rack mounted side-by-side in a 1U rack space with an optional RK-1 adapter.